Valentine’s Day will be here before you know it, what were you thinking about doing for your significant other? If you’re looking to be healthy, more personal, and to spend some quality alone time with one another, then opt for making a romantic home cooked meal instead of going out to eat. Home cooked meals will save your wallet, offer portion control, and give you the knowledge of everything that is in your meal. Let’s face it, you don’t always know how your food is being prepared or cooked when you go to restaurants. It’s important to remember that not all ingredients are equal, so follow these tips for what you should put in your special dinner. When deciding what kind of protein to cook for dinner, try looking up recipes that call for chicken or fish. Chicken and fish have less cholesterol and saturated fat than red meat, and they’re also high in protein. When cooking your protein, opt for baking or grilling instead of smothering it in flour and salt to fry. Spinach, kale and broccoli are great vegetables to add to your dinner. Kale and broccoli are both high in fiber and contain vitamin C. Spinach has iron and, like kale, is loaded with antioxidants. If you’re thinking about making a salad or having a side salad for dinner, mix spinach, kale and lettuce together so your salad won’t lack any nutritional value. Don’t skip out on having a grain with your meal. Grains can add important nutrients and minerals to your food, such as dietary fiber, iron and magnesium. When choosing a grain, look for whole grains like brown rice and quinoa. Brown rice is a good source of magnesium and is also high in fiber. Quinoa is actually not a grain, but a seed that is considered a grain. It provides protein and is also high in vitamin E and calcium. You can add these grains to basically any dish and enhance its nutritional value. Don’t feel guilty about what to eat on this romantic holiday. 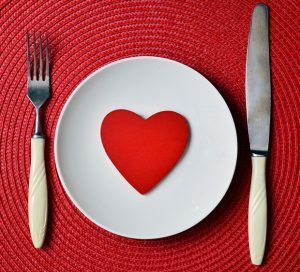 Celebrate with your significant other by cooking a romantic, healthy meal that will make you feel full and satisfied.